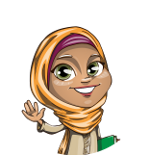 What does Hajira (Muslim Arabic Name) mean? The name Hajira (Arabic writing : هجرة) is a Muslim girls Names. The meaning of name Hajira is " Wife of Prophet Ibrahim "
Hajra هاجرا Wife of Hazrat Ibrahim .